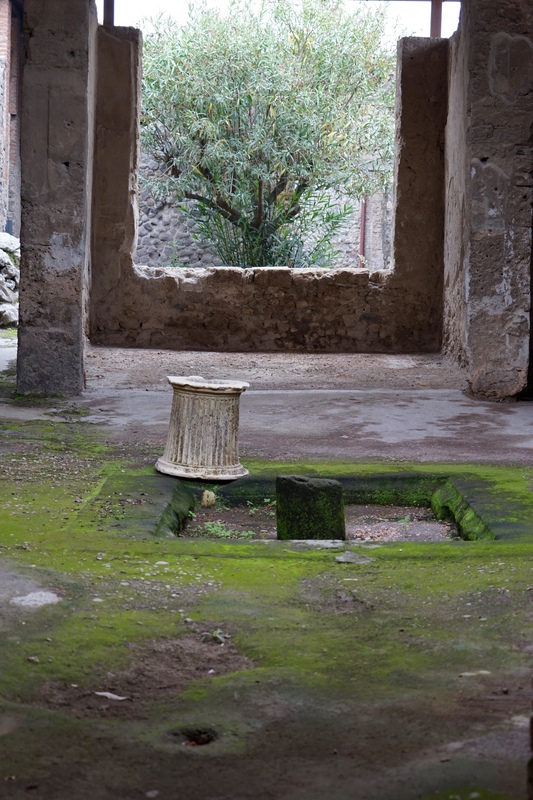 After a very laid back few days in Tuscany lounging around our villa we were ready for some excitement so headed south, all the way down past Naples and to the small town of Trecase which lies in the shadow of Mount Vesuvius. 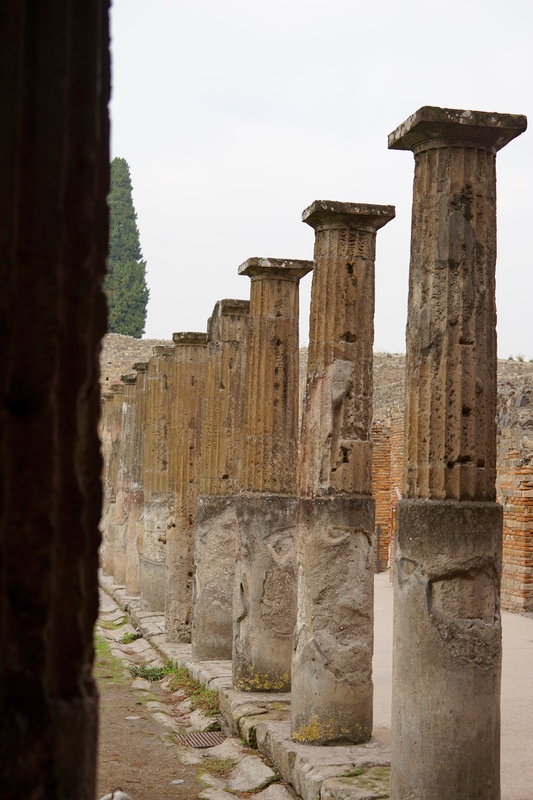 We decided to stay out of Naples as we wanted to focus on all of the major sites in the region and not have the hassle of going in and out of the city everyday. 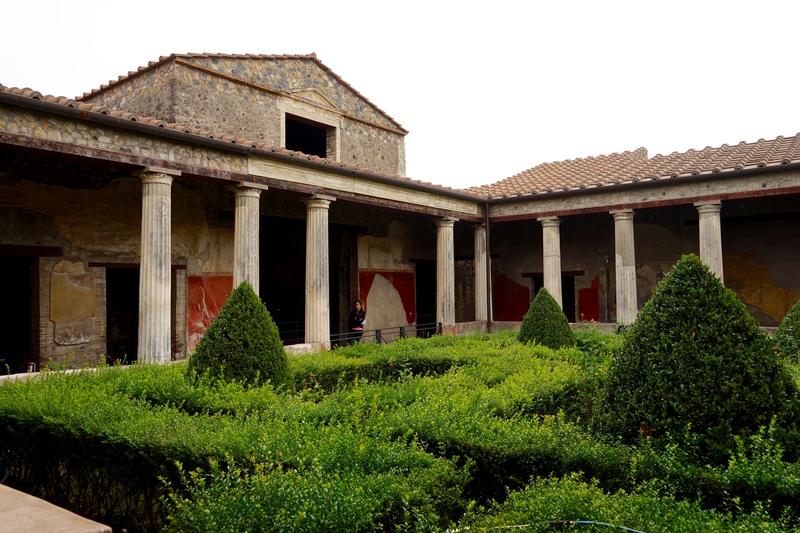 The place we stayed at was called Palazzo Rosenthal, a great family run independent hotel that was ideally situated in the middle of Pompeii, Vesuvius and Herculaneum and the perfect place to use as a base if you have a car. 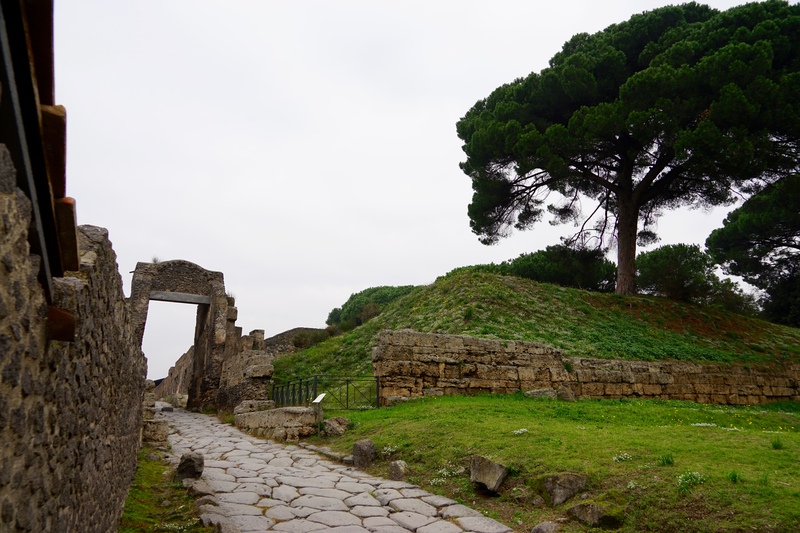 The next day we kicked of our adventures with a visit to Ancient Pompeii, we had both learned about Pompeii at school (I think everybody did) and were both really keen to visit, but neither of us were completely sure of what to expect. 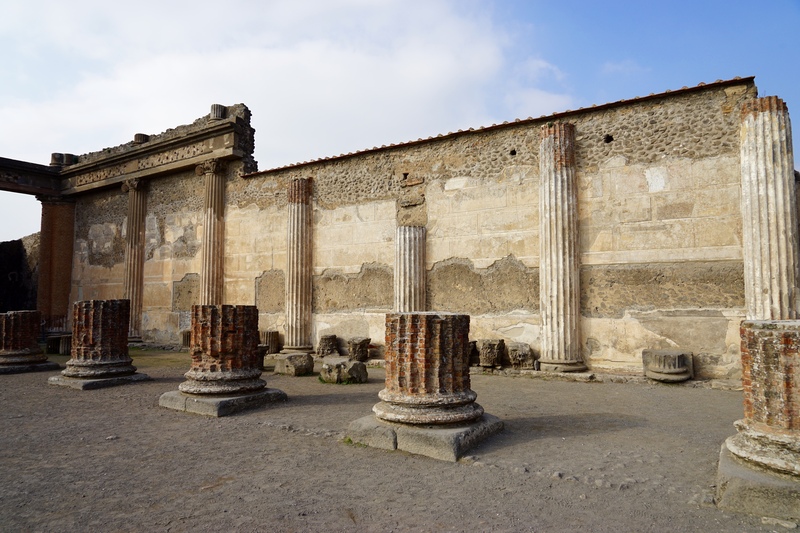 The drive to get there involves driving through the modern town of Pompeii which can be pretty hectic so I would advise leaving early to try and beat the morning rush. There was plenty of car parking nearby which was fairly cheap and we managed to pick up a fairly comprehensive English guidebook to the site for 7 Euros from a stall on the way in. 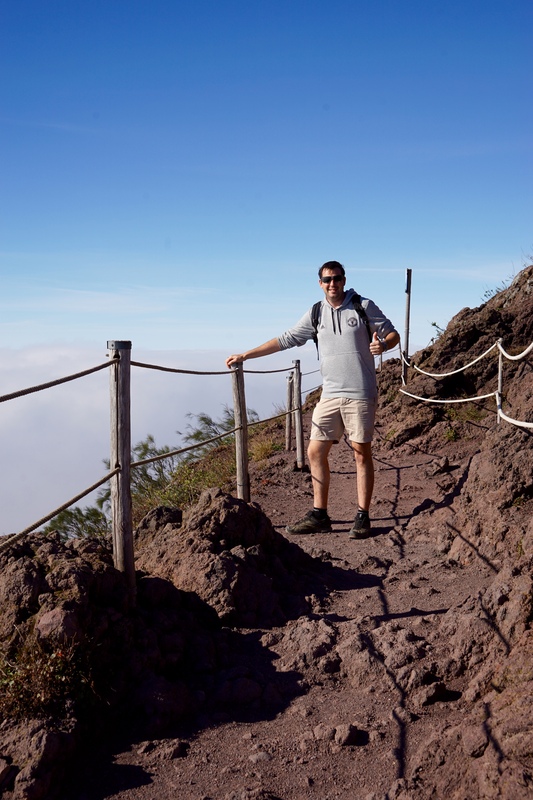 There is limited information around the site so I would recommend buying a guidebook, you could also pay for a guide but we enjoyed doing it self paced and wandering around at our leisure and reading about things as we discovered them. The scale of the site is massive, you definitely want at least one full day to try and get around it, even then you won’t be able to see everything and do it justice. 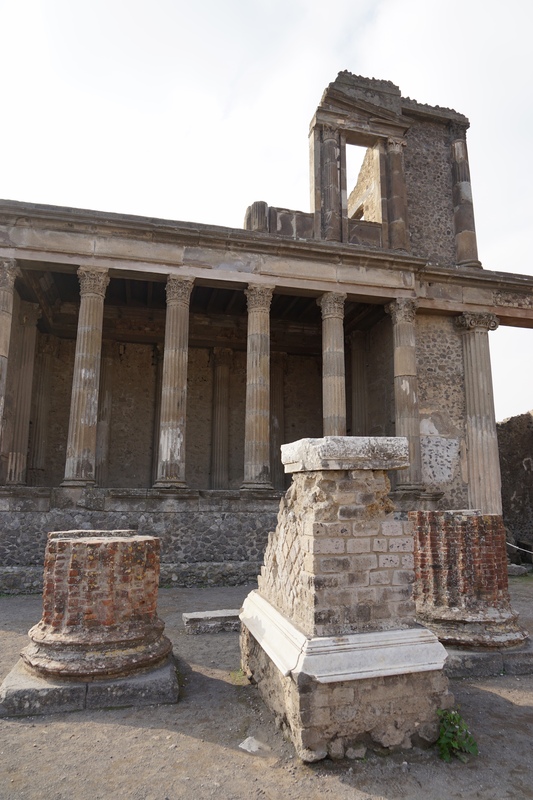 Walking around Pompeii is incredible, when Vesuvius erupted in 79CE the city and it’s inhabitants were buried twenty five metres deep in ash. 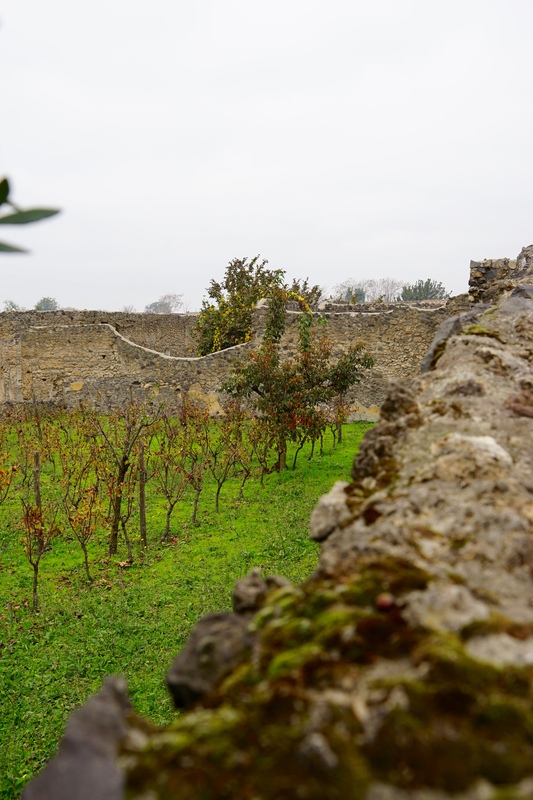 Over the centuries numerous archaeological digs exposed more and more of the site and thanks to this careful excavation and years of restoration it is now possible to walk around and explore an actual Roman town as it was almost two thousand years ago. We entered from the top entrance rather than the main entrance, by accident more than strategy, which worked out really well as for our first hour of wandering around we barely saw another person. 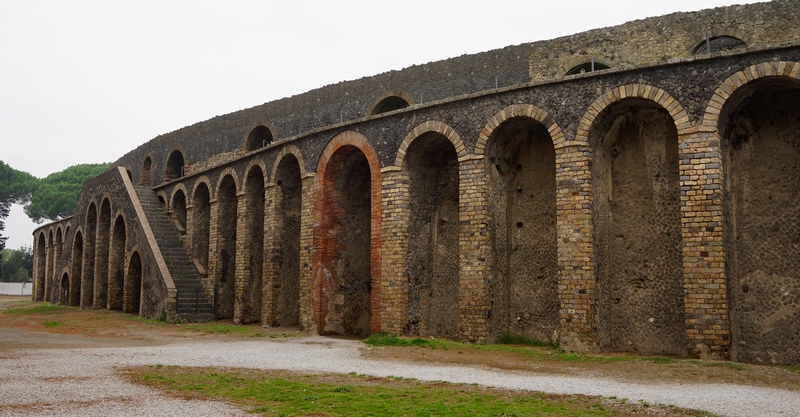 The first place we came across was the cities arena, this is the worlds oldest preserved Roman amphitheatre and was home to many a gladiatorial contest whilst in modern times has also been the setting for a Pink Floyd concert. 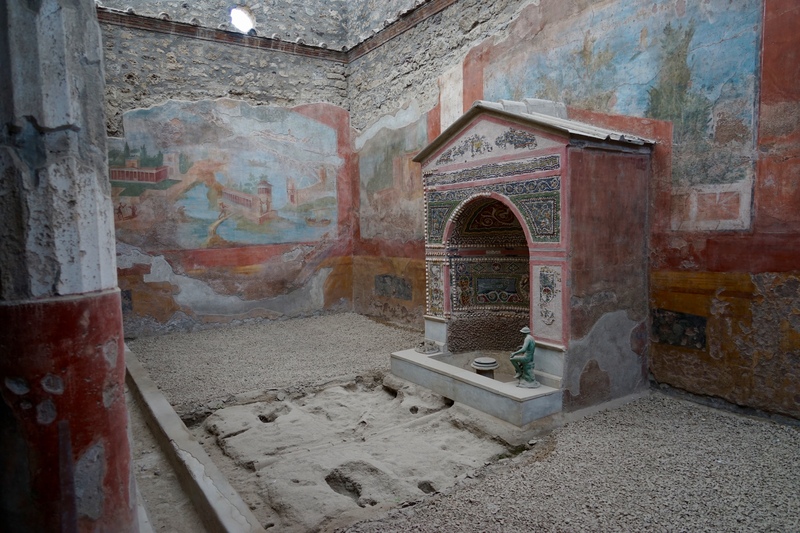 Currently they have built an exhibition space in the centre of the amphitheatre which is exhibiting plaster casts of the bodies discovered in the excavations. 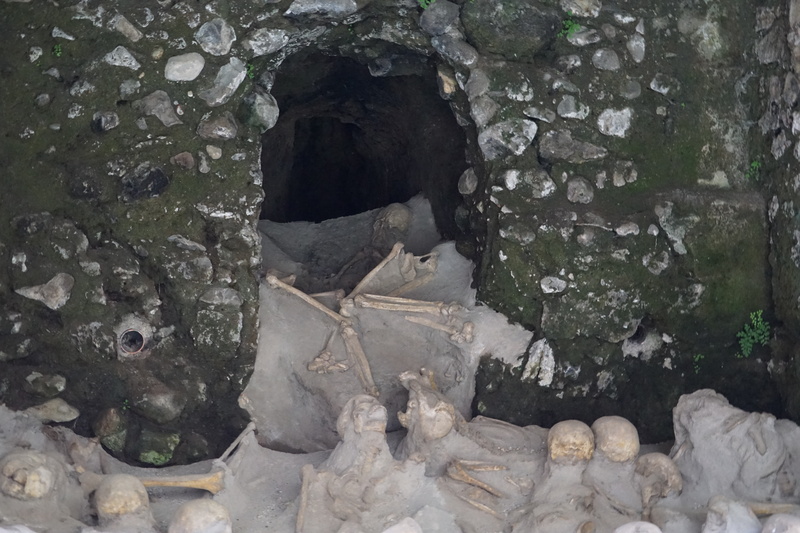 Instead of digging up the bones during excavation they instead poured plaster into the gaps in the hardened ash where the decomposed bodies had been encased. 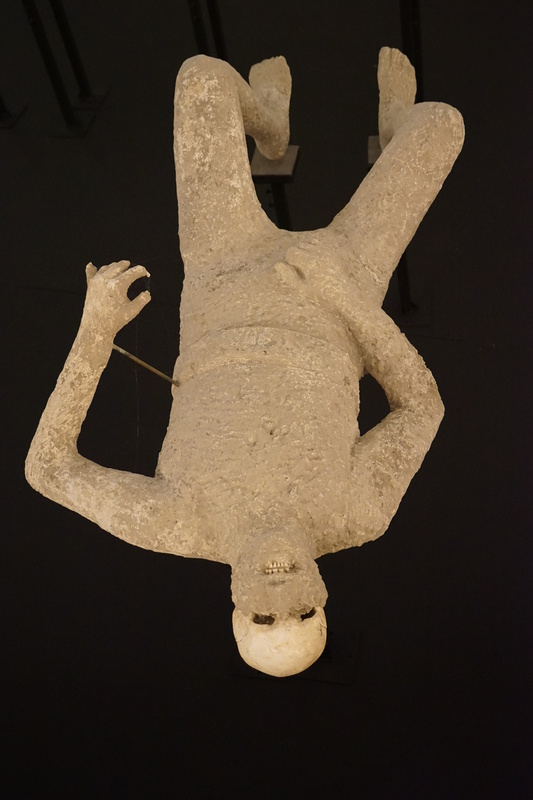 After the plaster had set they chipped off the ash to reveal a cast of the body encasing the skeleton and recreating the form of the person as they were when they were buried. 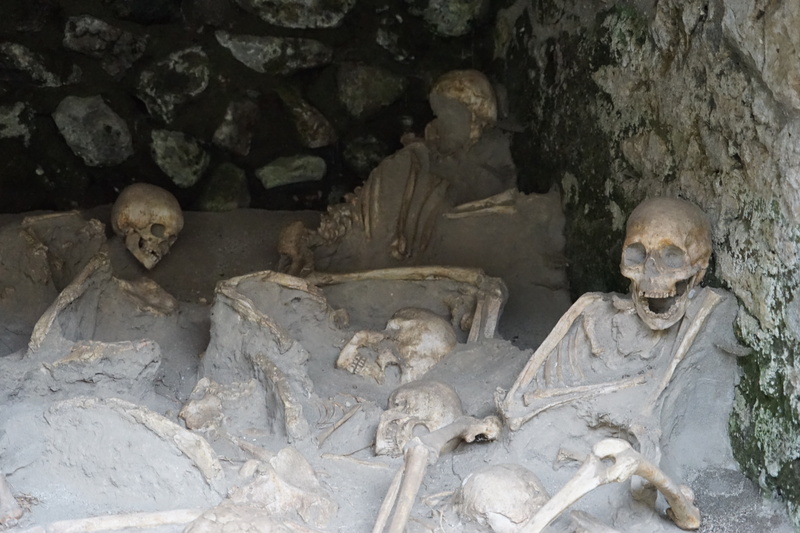 It was quite strange and moving to see casts of the men, women and children of Pompeii and know that their skeletons were encased in them and to be able to see how horrifically they died thousands of years ago. 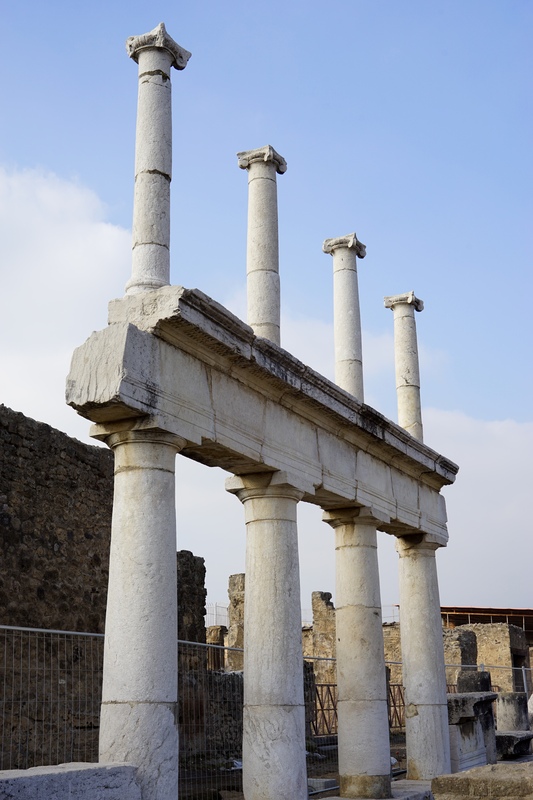 So far over 1100 bodies have been recovered from the Pompeii site. 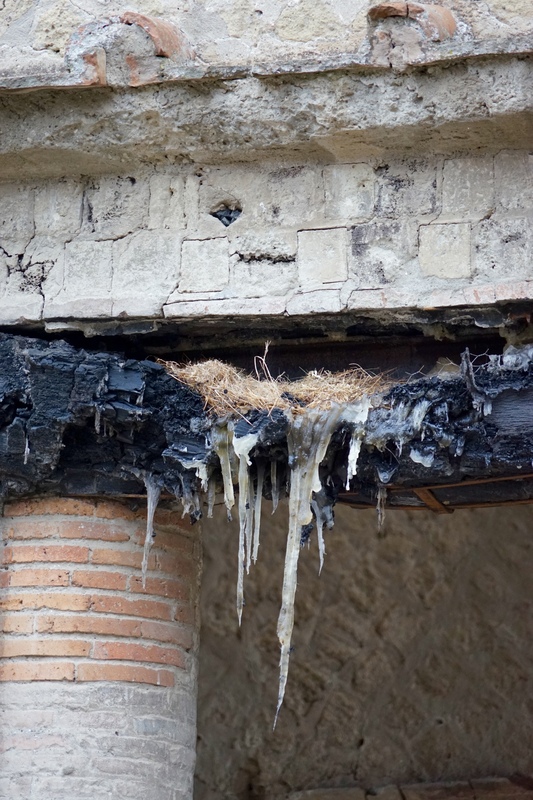 It was not just the remains of people who were preserved by ash, many of the buildings are in incredible conditions, many still having their original roofs, tiled floors and painted walls. The pictures above are from what was the equivalent of a modern takeaway, it was situated on a major thoroughfare and would of done a great trade as people came and went from work. It had a service are on the street which had six areas were heated vessels could be kept to serve hot food, it also had the owners accommodation on site off to the side and an opulent eating area out the back complete with daybeds so people could lounge as they ate their meals. 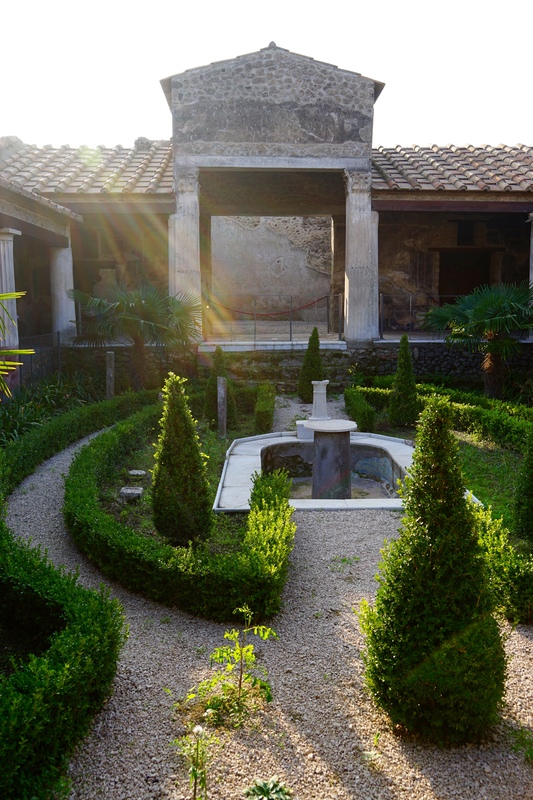 Some of the villa’s were incredibly richly appointed, many had open courtyards with manicured gardens in the centre which have been recreated and replanted using information found on wall paintings and sketches excavated on site. 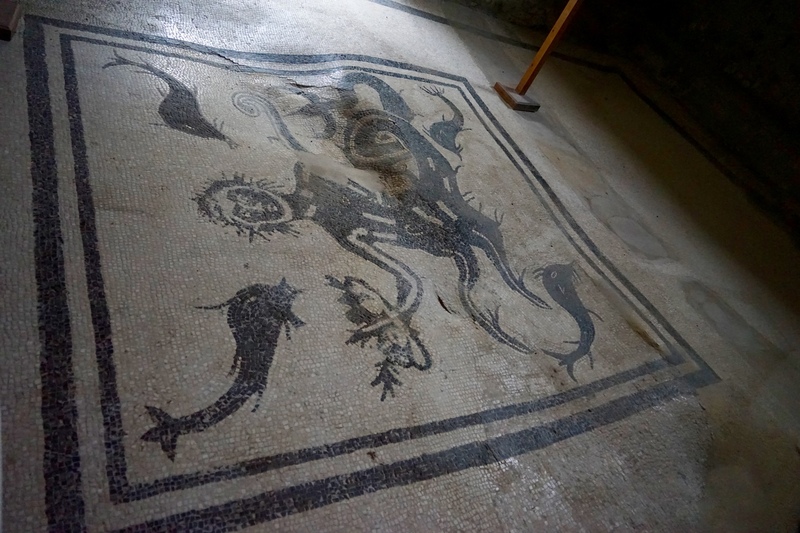 All of the villa’s featured amazing tiled mosaic’s on the floor, painted frescoes adorning almost every exposed wall and marble furniture as well. 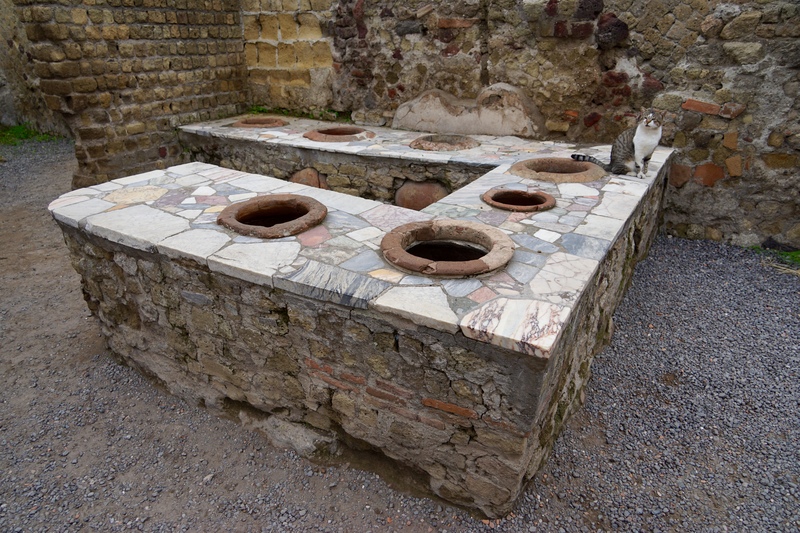 Despite Pompeii being known mainly as a fishing port it was evident their was definitely a fair bit of wealth to go around. 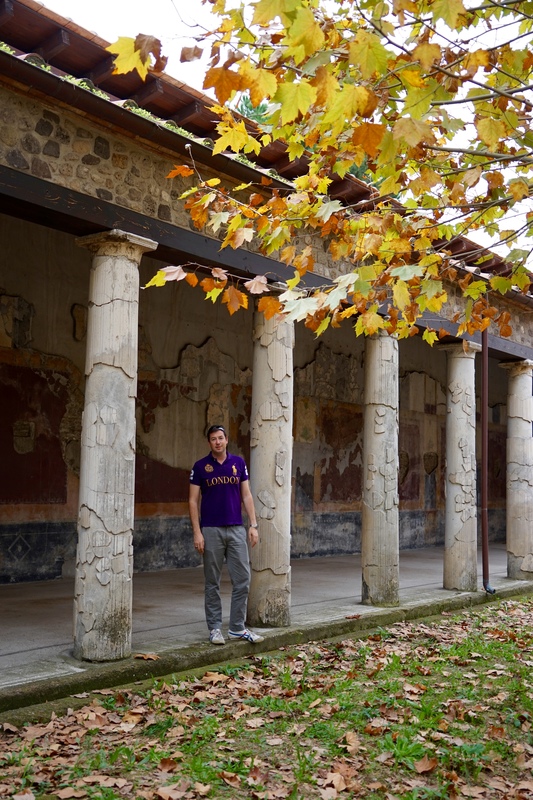 After working our way through one of the residential areas we came to the temple and theatre district. 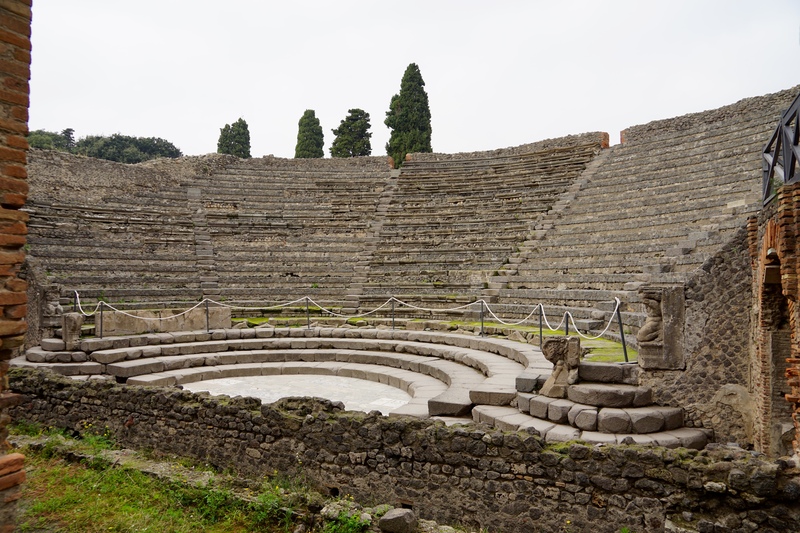 The first theatre we came across was the Odeon, a small theatre with a capacity of 1000. 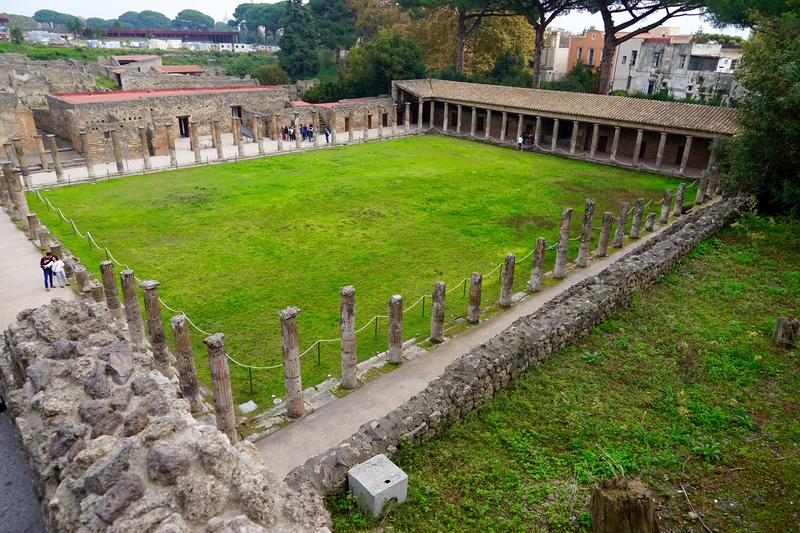 Next door to the Odeon was the barracks area in which the gladiators trained and were accommodated. 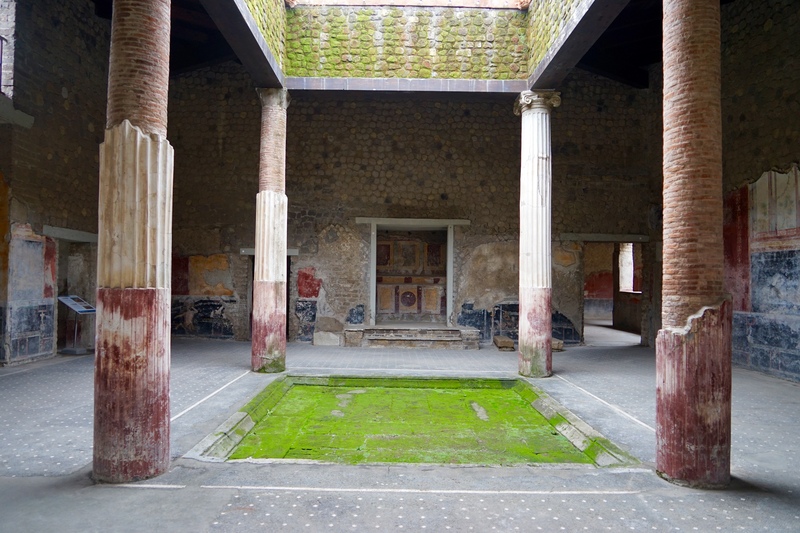 As well as a large open area for training their were barracks and rooms for the gladiators to sleep in as well as an armoury. 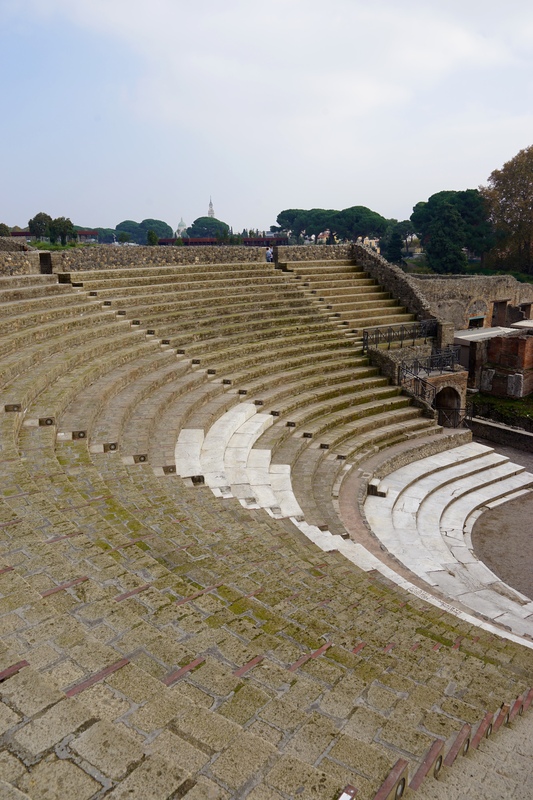 Next was the large theatre which had a capacity of five thousand and incredible acoustics, we were on the upper levels when a tour guide sang an operatic song from the stage area and the sound carried with incredible strength, more so than many modern theatres we have visited. Behind the theatres were the temples, the Temple of Isis being the best preserved, however we could not get in to check them out only take a couple of quick pictures as they were behind locked gates. 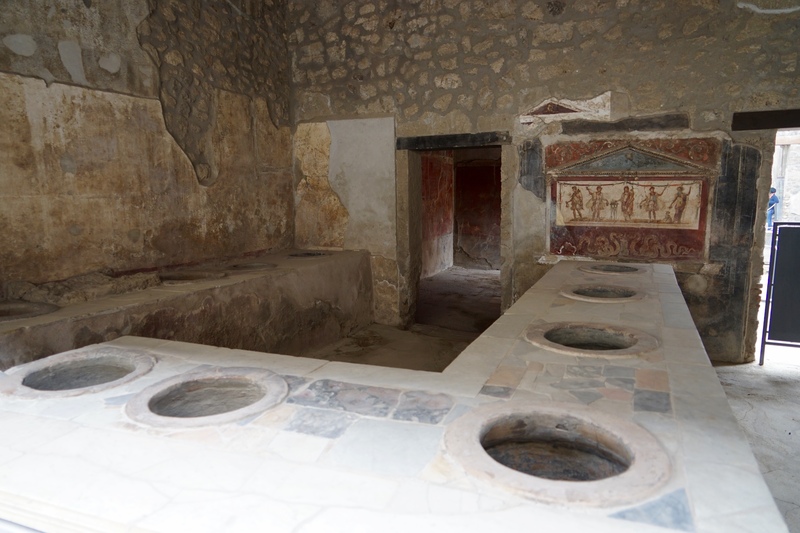 Some of the best preserved areas in Pompeii were the bathhouses, these giant complexes normally wrapped around a central courtyard and consisted of a change room complete with areas for people to leave their clothes with a sauna in the corner, separate chambers for a cold bath, a tepid bath and a hot bath. 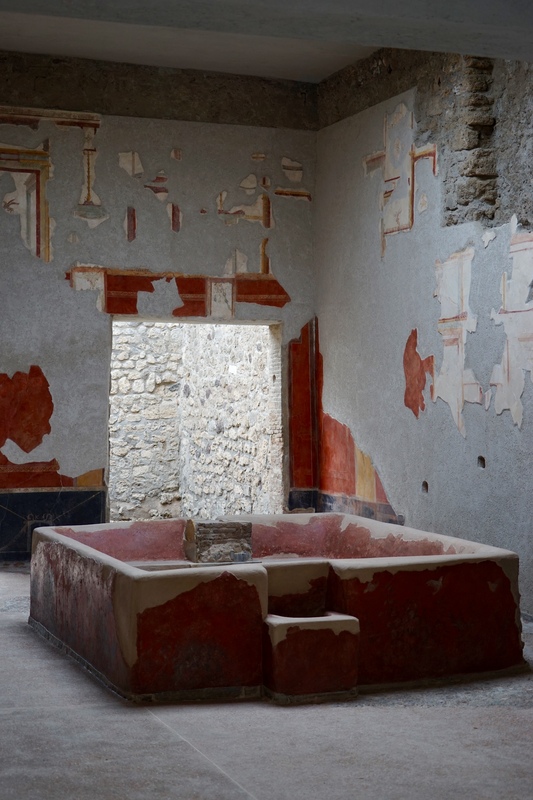 Each of the bath houses were mirrored so to provide separate versions of these chambers for each gender however the women didn’t have a cold bath, apparently this was only for the men to help them demonstrate their masculinity. 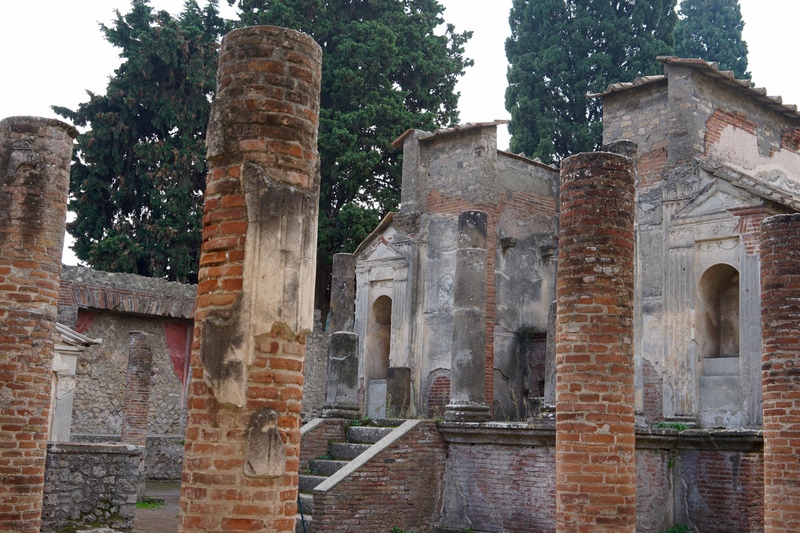 One of the largest ruins on the site is that of the basilica, most of it had collapsed and materials had seemingly been removed and recycled over the centuries. 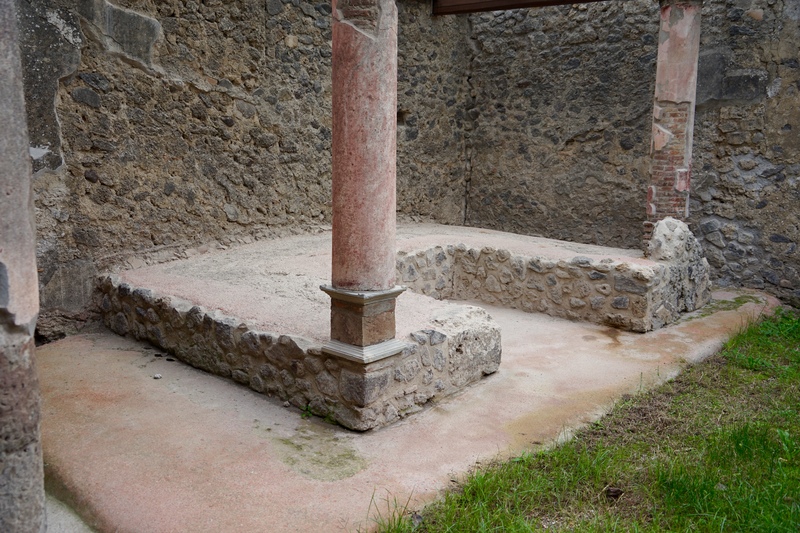 The foundations were still there as well as the bases of some of the pillars and a few of the external walls. 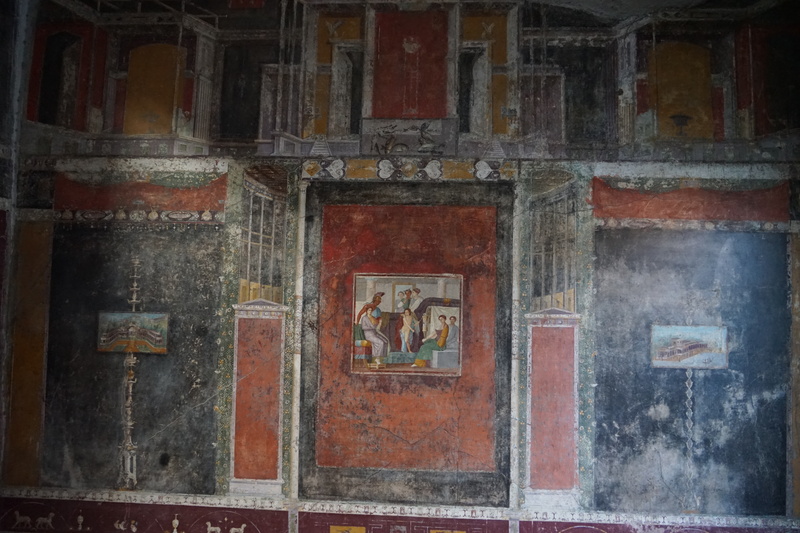 It would have been an enormous building and fairly extravagant in it’s day, now it it one of the few buildings where you need to use your imagination and somewhat of an anomaly as the rest of Pompeii is in such good shape. 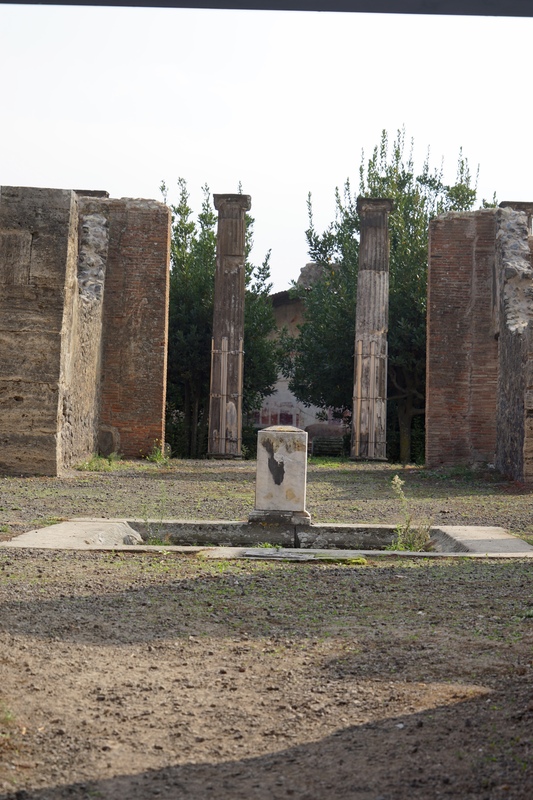 In the square adjoining the basilica are the ruins of many of the civil buildings as well as the remains of the Temple of Apollo. As this was one of the most open and exposed read it seems as if the buildings here, much like the basilica, came off much worse than the rest of the town. From what is left of them it was clear that these were some of the largest and most important buildings and that they would have been fairly spectacular. 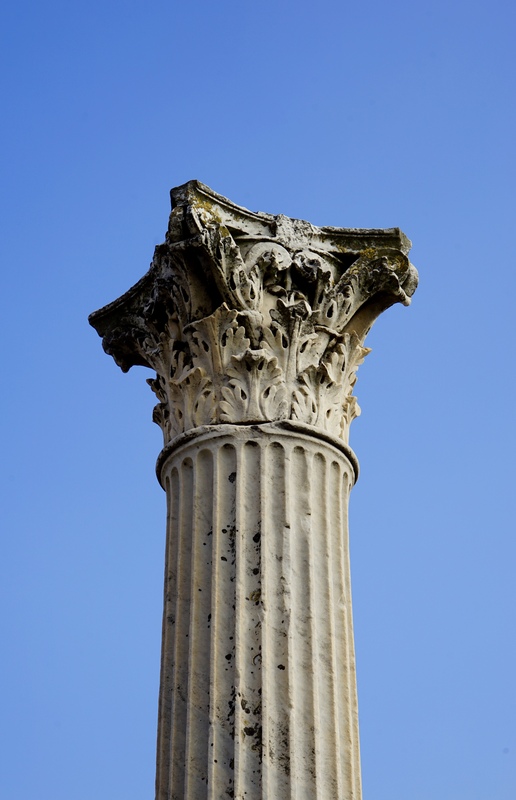 Their ruins still lend themselves to some great pillar photos as seen below. 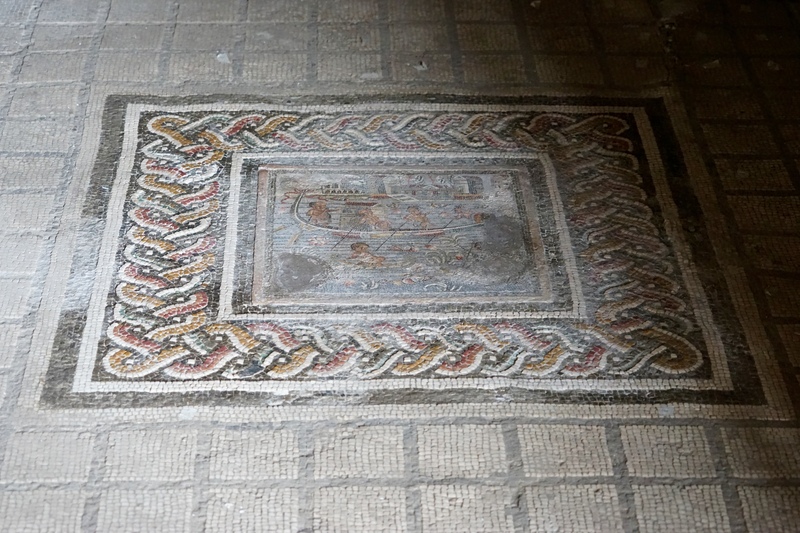 Much as today the wealthier citizens were always trying to one up each other and showcase their wealth in different ways throughout their dwellings. 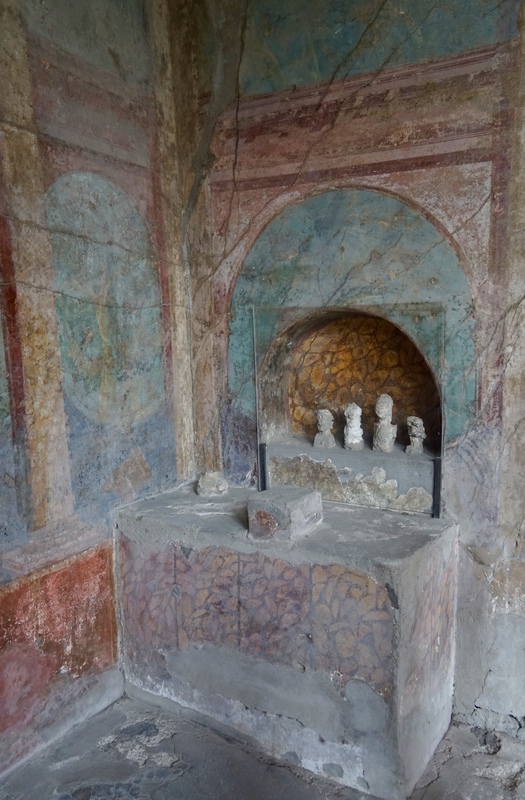 As well as commissioning painters to create incredible frescoes on the walls many houses had shrines, fountains and statues in positions of prominence to make sure everyone could see how rich and successful they were. 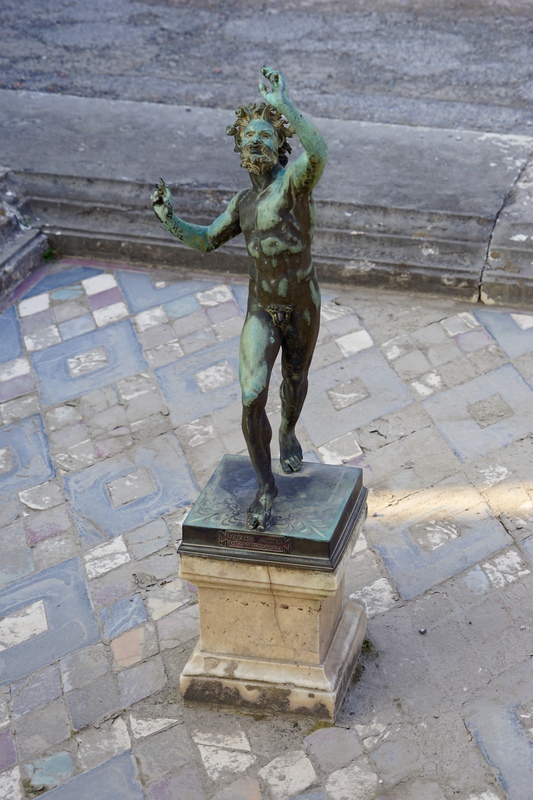 The most lavish villa in Pompeii is known as The House of the Fawn, so named because of a small statue located at it’s entrance. 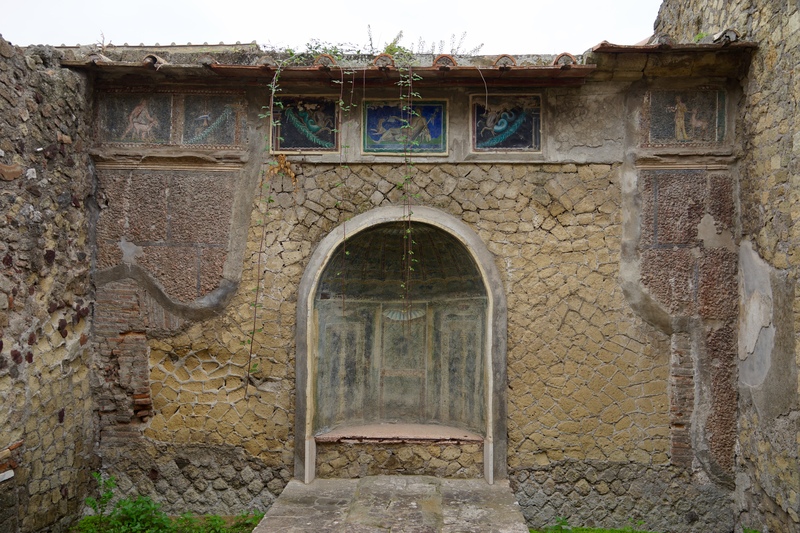 No documentation or evidence has been found of who owned the villa but they must have been someone of note, it was enormous, covering an entire city block. 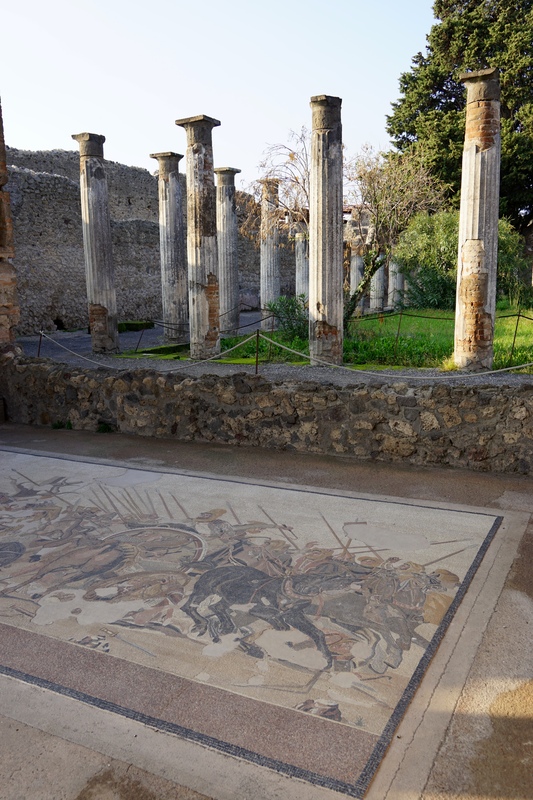 The floors were covered in incredibly detailed mosaics of battle scenes and the walls had some of the most intricate and impressive frescoes in Pompeii. Mr Fawn was to be our last visit of the day as the sun was getting close to setting and I was keen to try and complete the crazy little drive before it got dark. Once we got back we headed to Pizzeria la Bricola for dinner, this place is an absolute institution in Trecase and seemingly the hub of the community. On arrival we were shown to a table out the front and the owner who spoke very little English phoned up his mate who was fluent so he could help us order. After ordering we sat and watched as almost every car that drove through the intersection stopped to come and grab some food or just say hi. We later found out that the owner had taken over from his father and they have been serving delicious food here for decades and people travel from as far as Naples to have his pizza on a regular basis. We had two pizzas, a bottle of water and a special reserve beer all for only 15 Euros and the pizza was up there with the best we have ever had. Probably worth the trip down to this end of Italy just for the pizza! 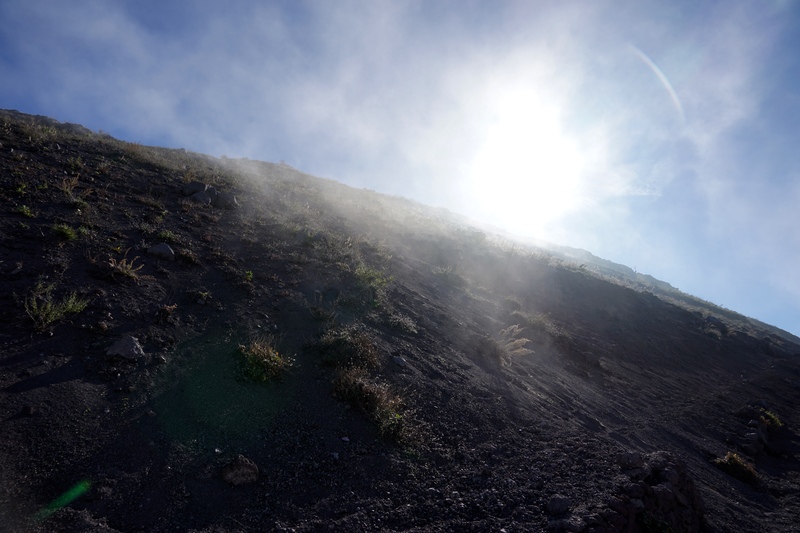 The next morning, largely powered by pizza, we set off with a spring in our step to climb Vesuvius. 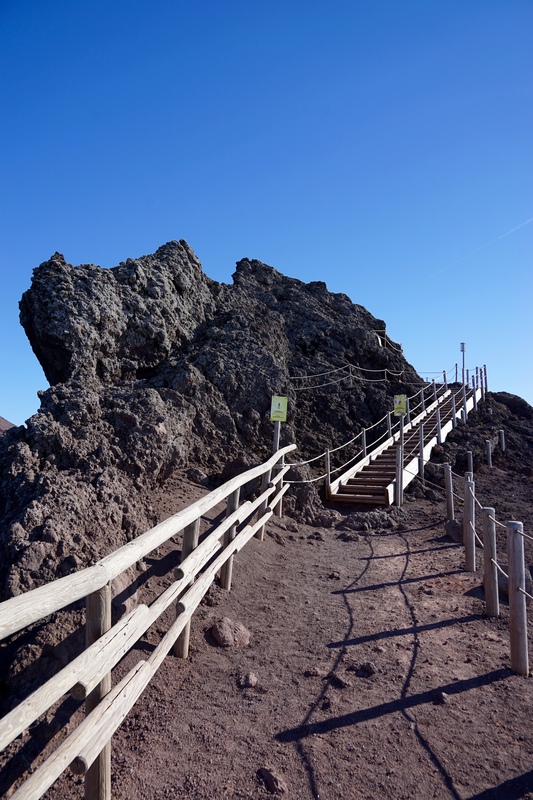 We had heard mixed reports about driving up to the top with many blogs, reviews etc advising us to take public transport… It was an easy drive and there was free parking at the top so if you have a car definitely drive! 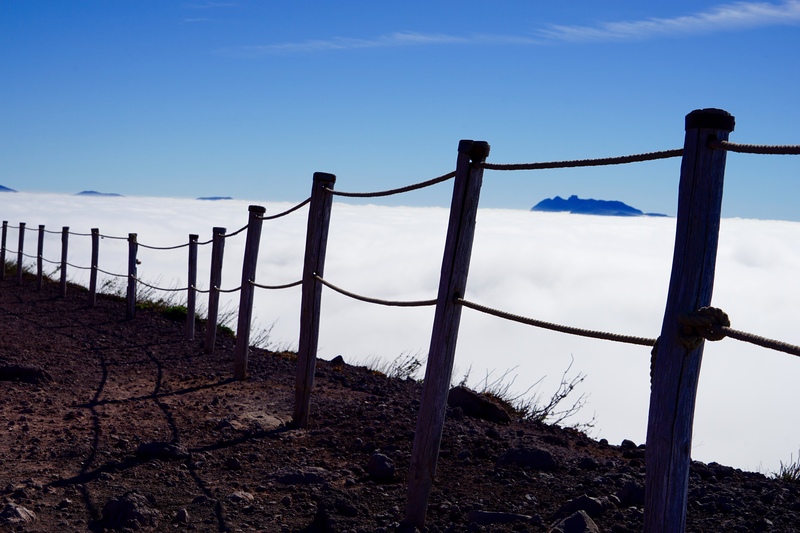 We started the walk up in overcast gloomy weather but quickly climbed above the cloud level as we approached the summit and the crater. 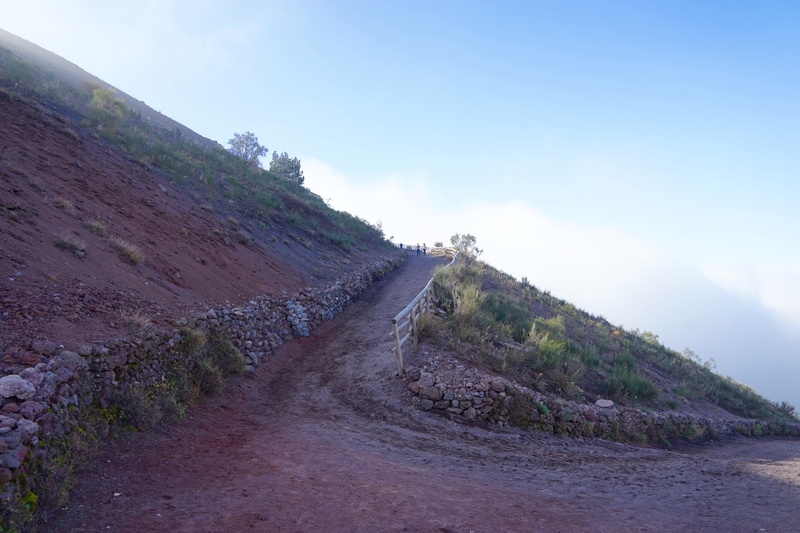 The weather up the top was spectacular and it was a relatively easy climb compared to many we had done on the trip, within forty minutes we were on the top. 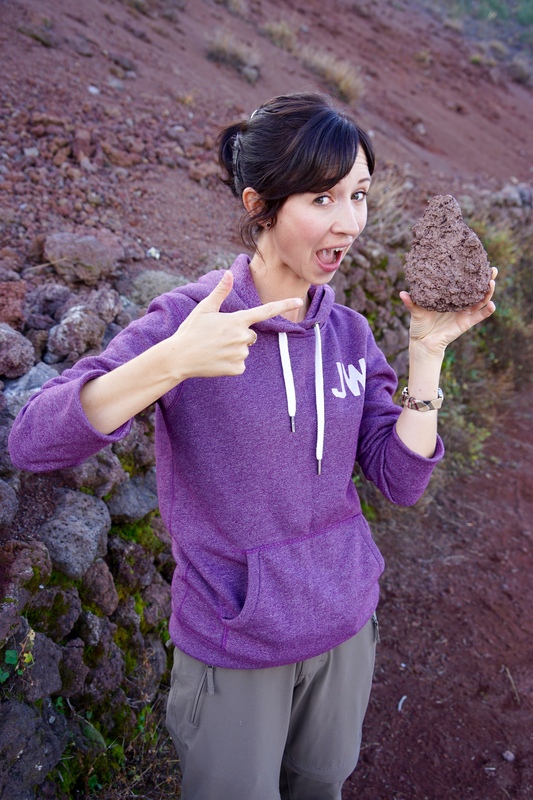 Jess was very excited by the landscape and particularly the volcanic rocks, stopping to souvenir a couple of samples look at the geology in this world heritage site on the way. Once at the top you had a clear view into the crater, whilst the volcano is technically dormant there were volcanic gasses rising through the earth in several spots, definitely enough to give us a reminder of what the mountain is capable of (Not that we needed one after our tour of Pompeii the day before). 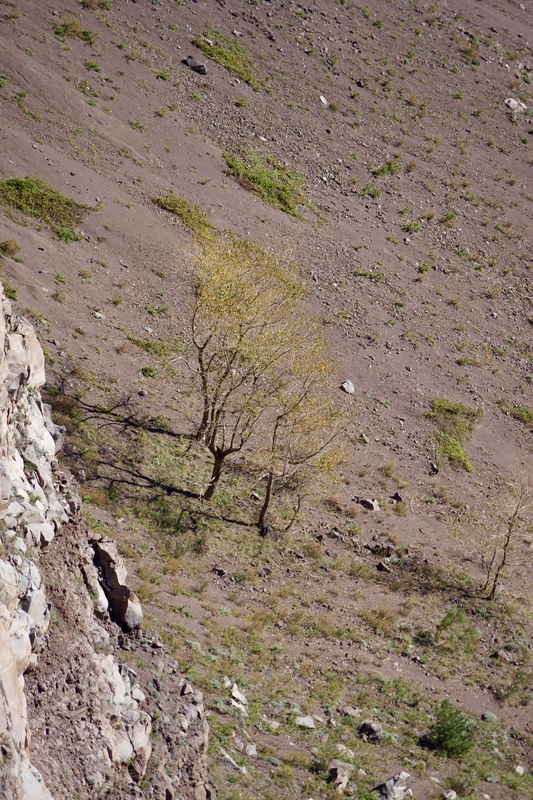 I thought it was interesting that despite much of the landscape being desolate on the climb to the summit there was quite a lot of vegetation growing inside the crater, probably due to the amount of minerals in the soil. The walk around the crater only took about half an hour and was fairly comfortable, some people didn’t bother going all of the way around. 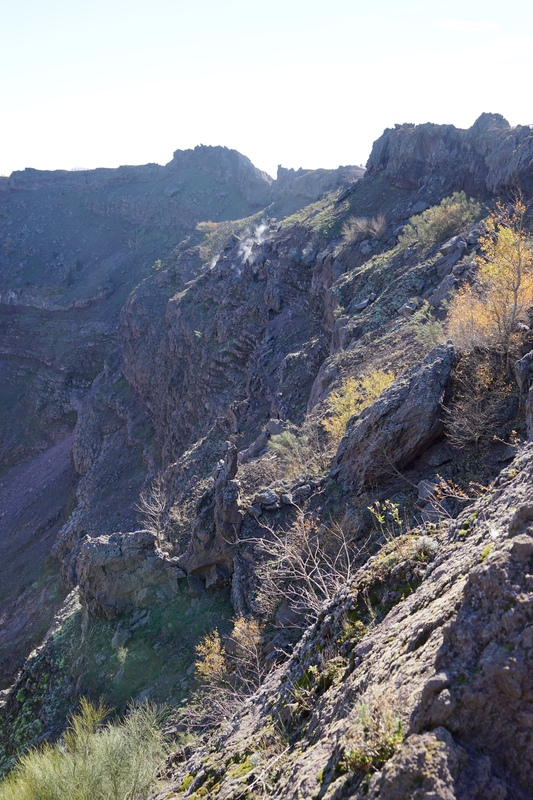 Definitely worth the extra bit of effort for the views into the crater that change every few metres and it gives you a sense of the size of the crater and how monstrous the eruption must have been. The view from the top was incredible as well, whilst the heavy cloud cover meant that we couldn’t see out over the bay of Naples the cloud itself was spectacular, rarely are you almost at the same level as the clouds and we played around with the camera for a while trying to get a great shot out over the sky. 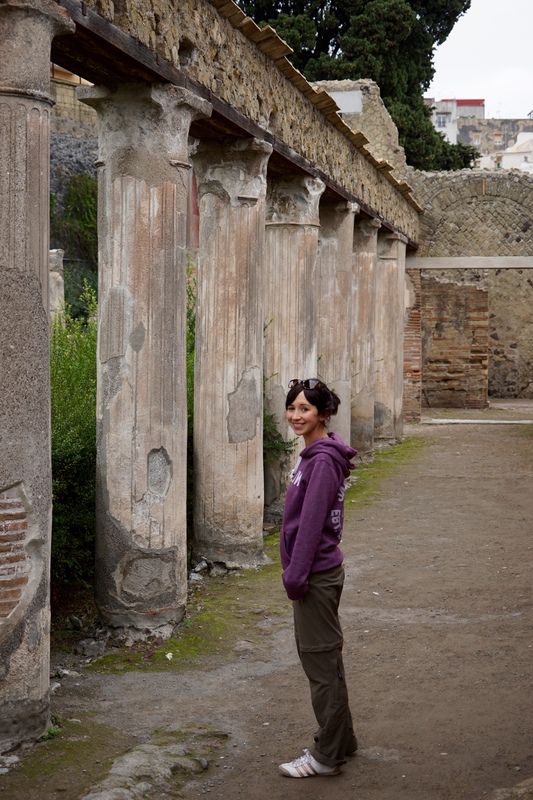 After taking in the views of the mountain we headed back down and tried to find our way to Herculaneum, another architectural site that had been recommended to us by the staff at our hotel. unfortunately our GPS couldn’t find it and we got so badly lost that we had to go back to the hotel and get directions. 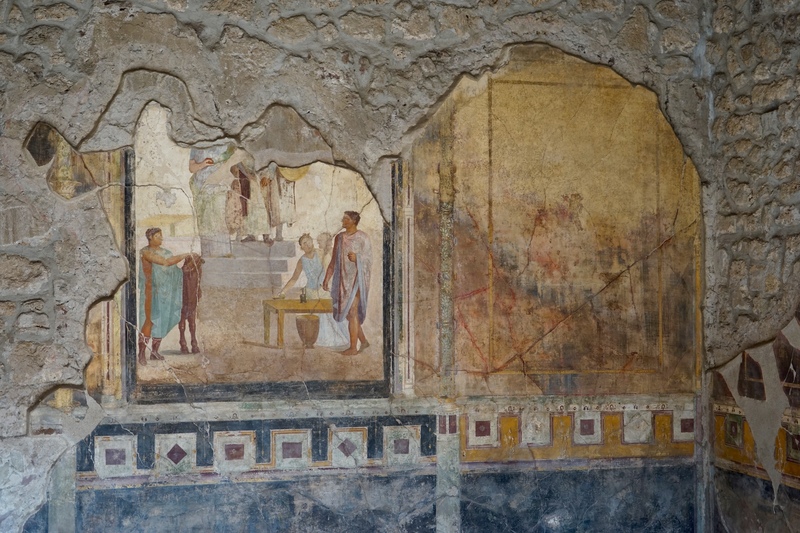 Eventually we found our way to Herculaneum, the excavated ruins of a wealthy town that was buried during the same eruption as Pompeii. 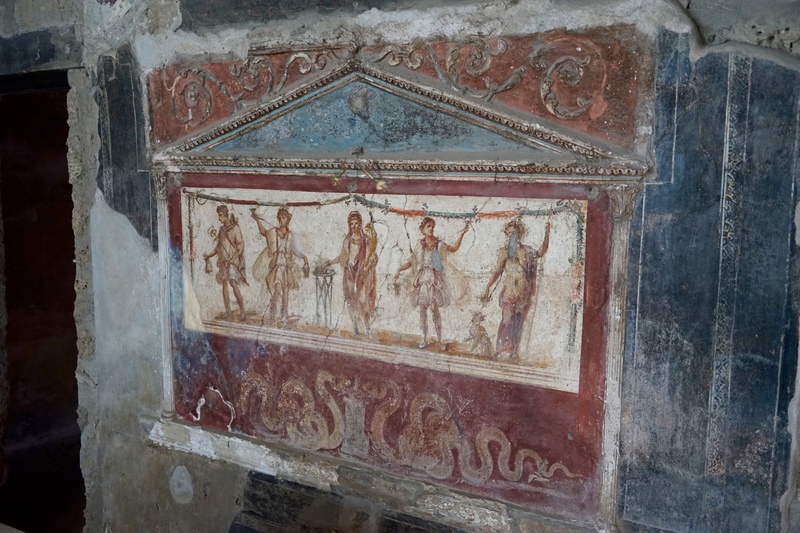 We had never heard of Herculaneum until we were put onto it by our hotel manager, apparently very few visitors come here compared to Pompeii which is a disservice to the site which is incredible to visit. 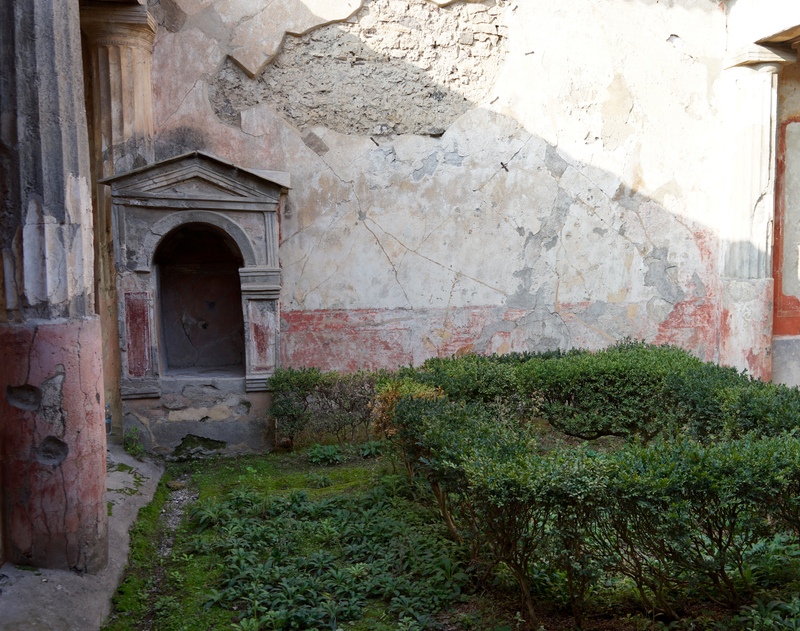 The original street levels were significantly lower back then so the ancient settlement is significantly lower than the current city which has grown up over the top of the old ruins, indeed some of Herculaneum remains buried and cannot be safely excavated due to the development on top of it. 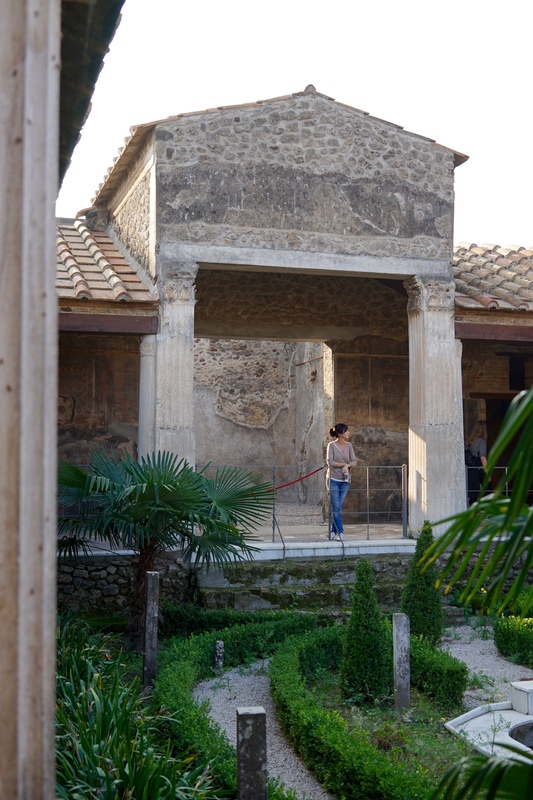 Pompeii was a port town whilst Herculaneum was a much richer community, this was evident from the wider streets and the rows of giant, lavish villas. There were incredible paintings and shrines throughout it and we even found the original cat cafe. 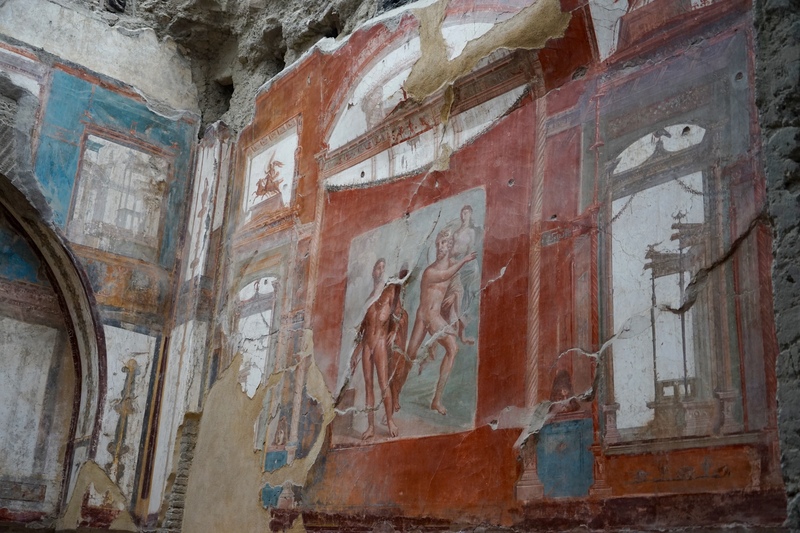 Due to the lower visitor numbers and the lower profile Herculaneum seemingly has a much lower budget for restoration and preservation, this is disappointing because this community was actually much better preserved than Pompeii by the pyroclastic material from the eruption. 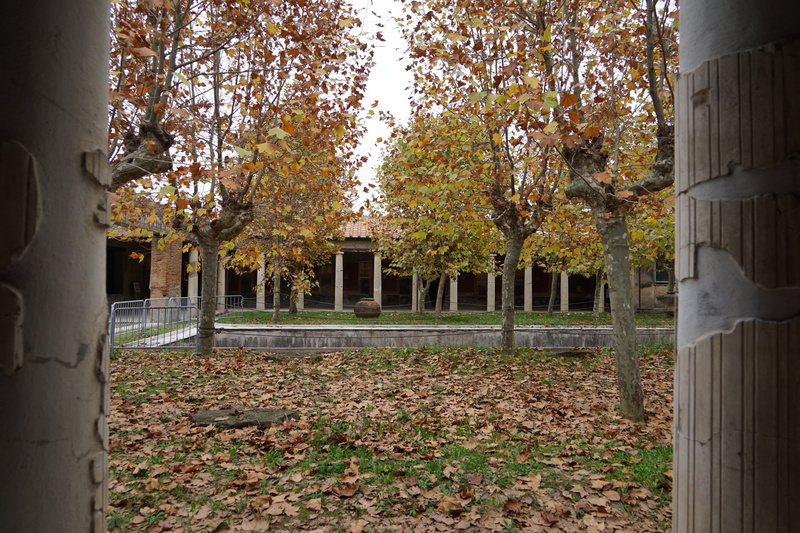 Here you can find wooden beams, ceramics and even examples of fabrics that have endured for two thousand years. 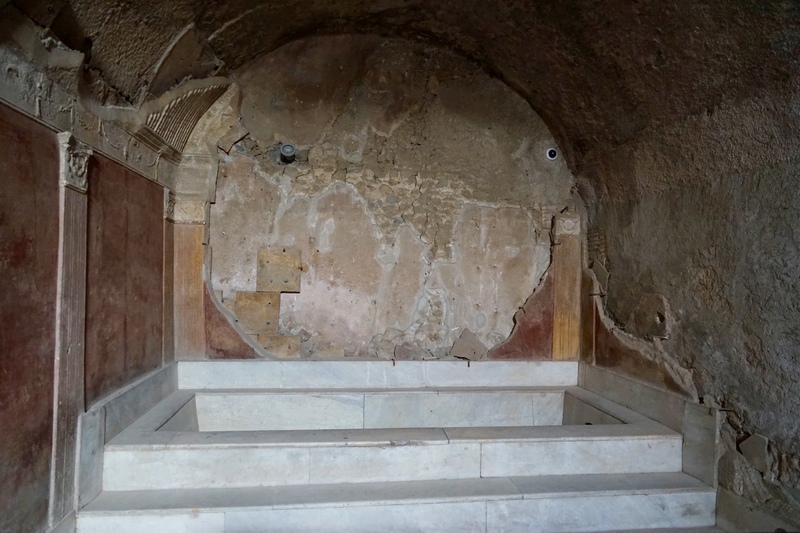 Throughout the site their are sunken floors, split beams and cracks through the walls that paint a clear picture of the severity of the blast. 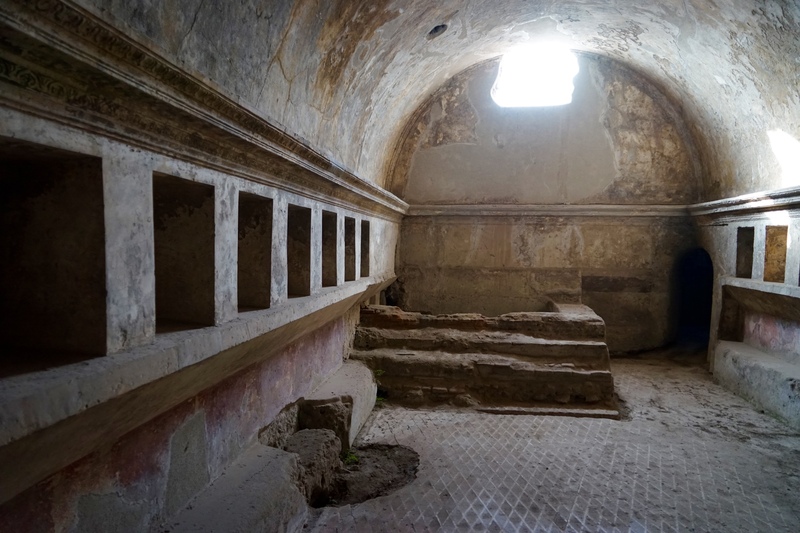 One of the more sombre finds during the archaeological excavations in Herculaneum were over three hundred skeletons that were discovered in the boat sheds at sea level. 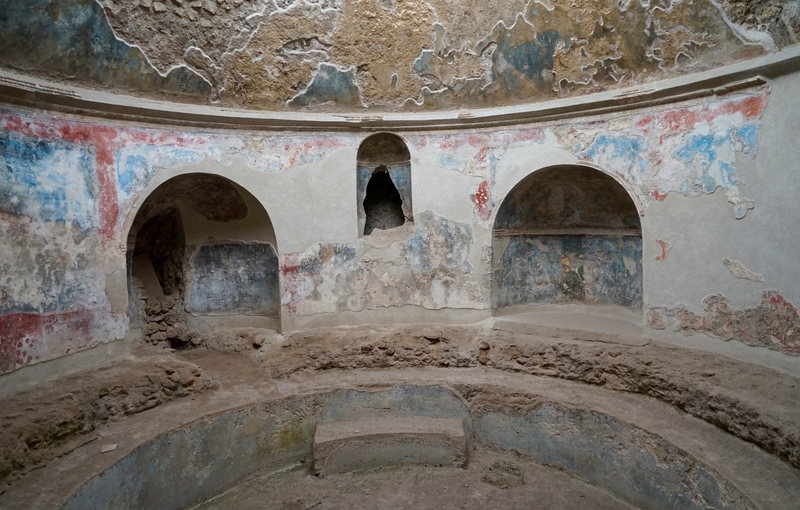 As these structures were located at a much lower depth than the villas on the surface they were only discovered in recent decades, originally the theory had been that the majority of the population had successfully escaped to see. Unfortunately their rescue had not arrived in time and they had all died together huddled on the shore hoping for their salvation to arrive before the final blast, a chilling way to end our day. 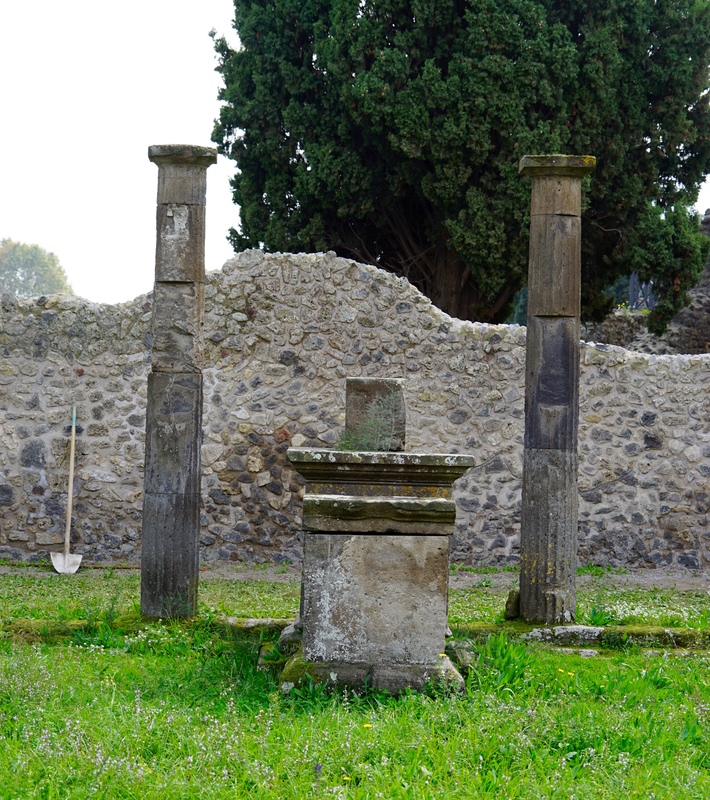 The next morning we were headed further south to the Amalfi Coast, before we left the region however we had one more archaeological site to visit. 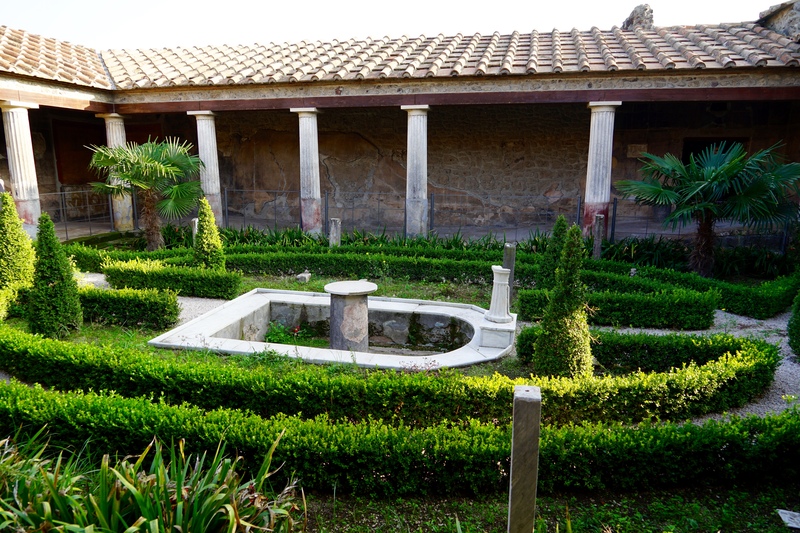 Whilst Herculaneum was a wealthy community Stabiae is a lasting monument to the excess of wealth in Roman Times. The majority of the site is one mega home, Villa San Marco, a monstrous property that covers more than eleven thousand square meters. 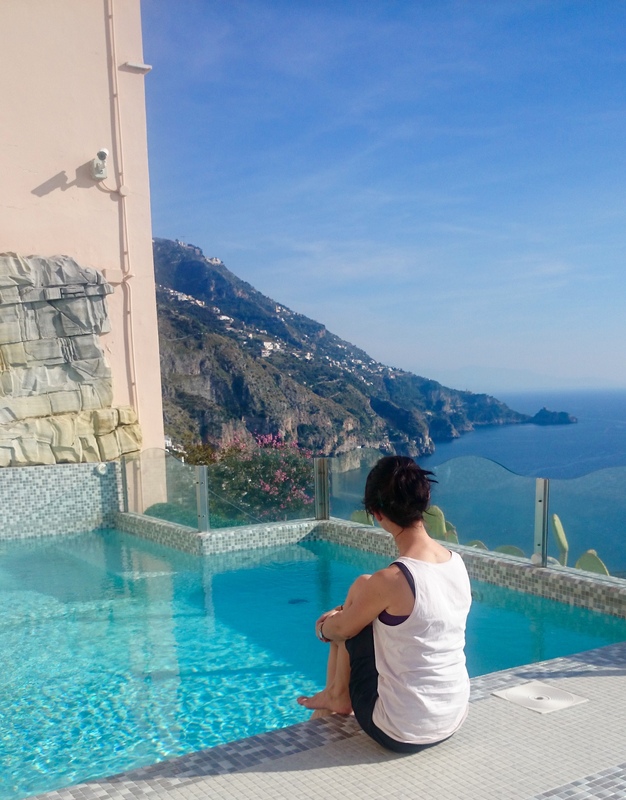 It had an infinity pool that looked out over the Mediterranean Sea, it’s own thermal baths, a giant landscaped courtyard and more rooms than anyone could ever need. It was tricky to find, interesting for a look but I wouldn’t call it essential compared to the other two sites, we were in and out in forty five minutes. 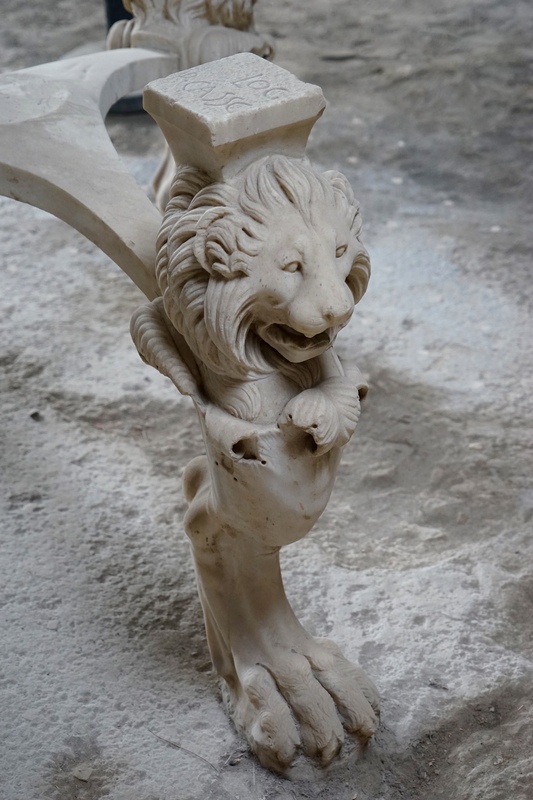 A good stopover though and worth a look if you are close. 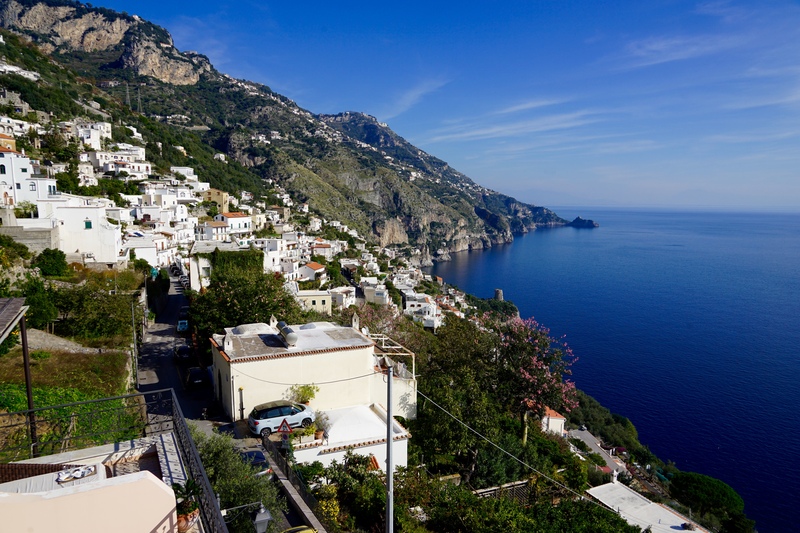 The Amalfi Coast road is one that many people speak about as being a bucket list kind of thing… I genuinely disliked the drive. 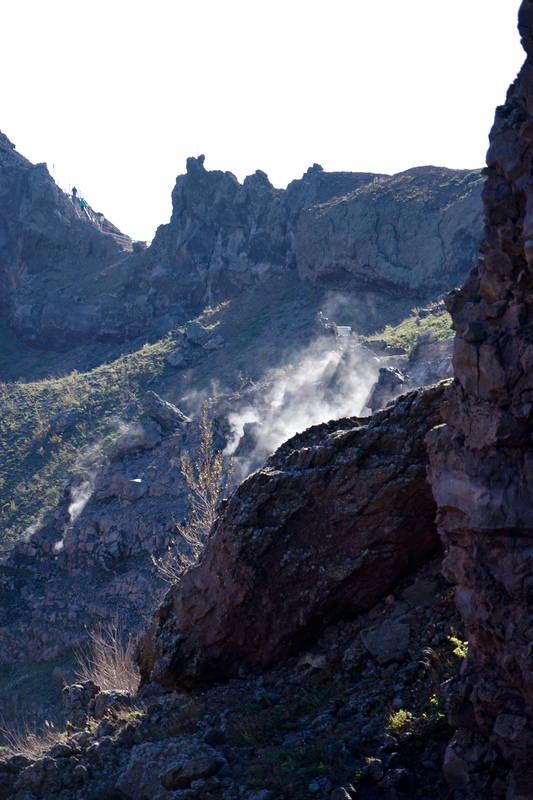 The scenery was incredible but the road itself was pretty bad and the local drivers were insane, I recommend a boat transfer or in a pinch catching a bus. We loved our little taste of the Amalfi Coast and will visit again, I definitely won’t drive it next time! On arrival at our hotel, the lovely Hotel Margherita we were treated to an upgrade to a balcony room and given a couple of free welcome drinks which helped take the edge of the drive. 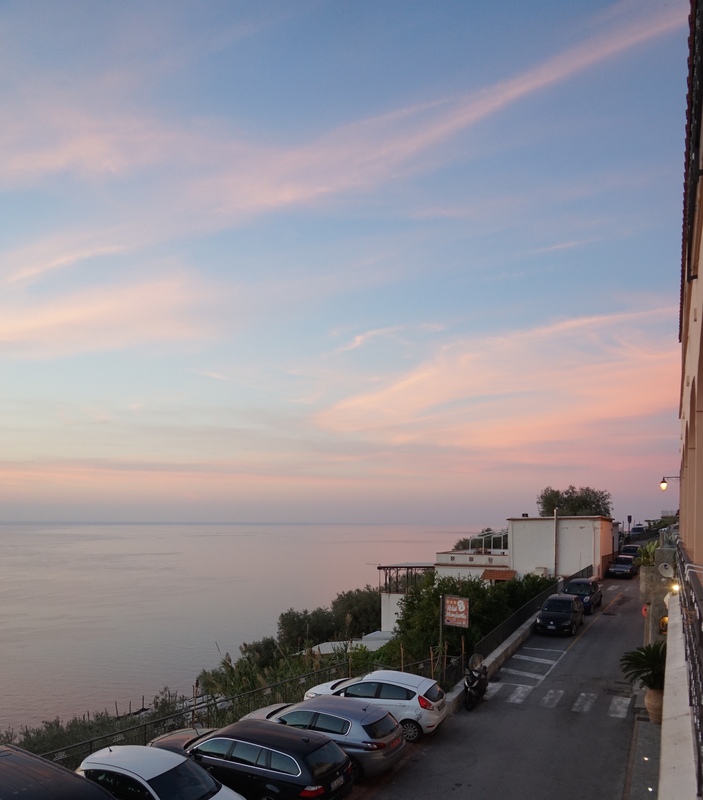 We were fortunate that the community of Praiano was having it’s annual festival that night, possibly to celebrate being nearly through tourist season, our hotel was the only one left open in town and clearly winding down. 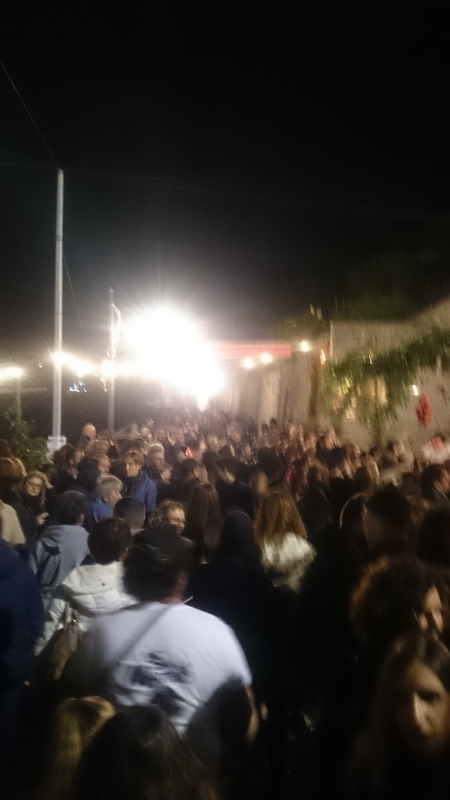 We had a great night up in the square by the church eating local food, dancing, taking in a highly competitive cake baking contest and sampling some free wine. The cake contest was incredibly competitive, over twenty cakes and all were tasted by a panel of judges who gave scores whilst the bakers watched on tensely. Luckily the nice lady who served us cake was the winner so we were happy and after the contest everyone lined up and got to try the cakes which were delicious. 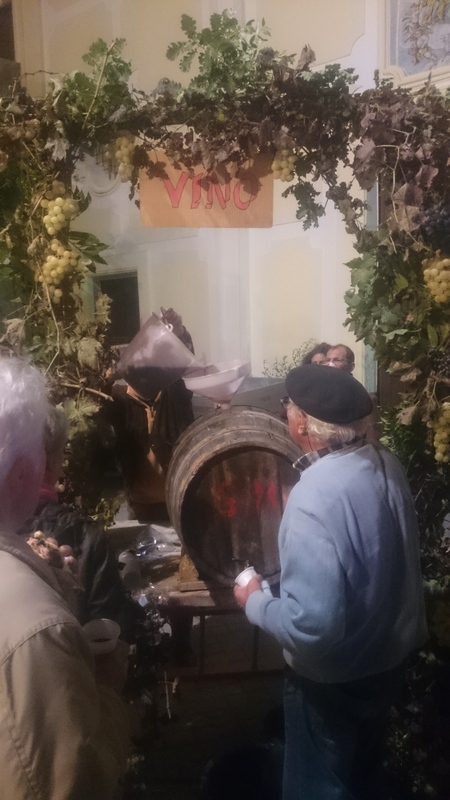 For me the star of the show was the guy who just turned up with his own barrel of wine and happily gave out samples all night, I certainly had a few. It would have been rude not to after all! 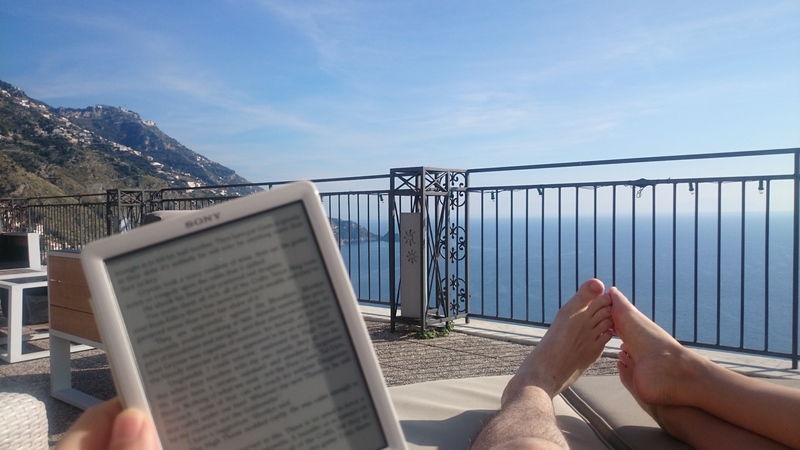 The next day we spent equal time exploring Praiano and lounging by the pool. As the tourist season had wound down there was very little open but it was still great meandering around the narrow streets and climbing down to the sea. The pool and the rooftop terrace at the hotel were incredible as was the day, perfectly clear and panoramic views along the coastline in both directions. The pool wasn’t heated so Jess was more comfortable on the side, I braved it for a while and it was very refreshing, not quite so cold as the snow melts on The Isle of Skye thankfully. After some time by the pool we retired to the rooftop terrace to lounge the day away with our readers before finishing up our whirlwind visit with a delicious dinner in the hotel restaurant. 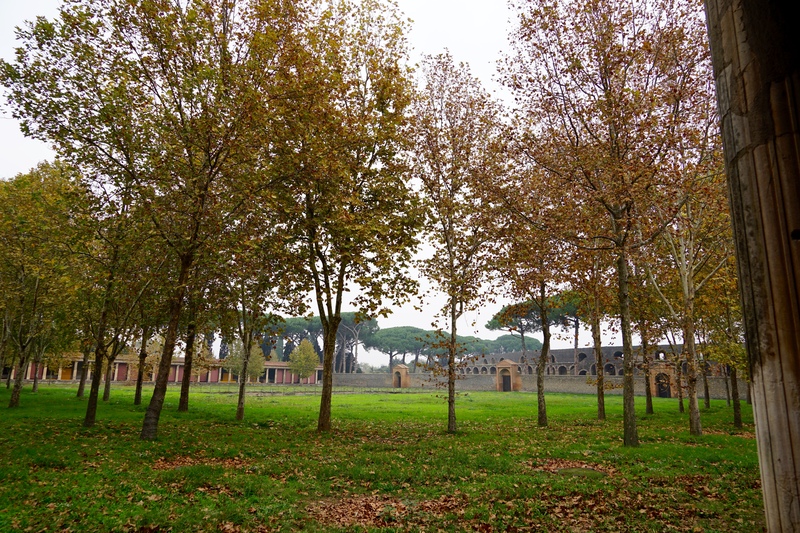 Thats all for this fun filled addition of the blog, our next stop is Rome itself so we will finally be living up to our title!